Meerkats are a type of mongoose but get their name from a South African Dutch word meaning ‘lake cat’ as they often live near water. A colony of meerkats lives in a network of burrows with many entrances and each member of the group takes on a specific task – from baby-sitting and teaching youngsters how to survive to foraging and sentry duty. When not on duty, they sunbathe or sleep in shade. 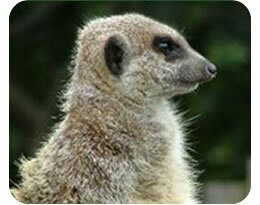 Meerkats have a high immunity to snake venom and scorpion stings. They usually bite off the sting before eating the body of a scorpion.